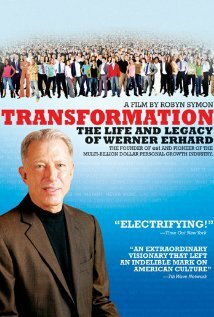 On Saturday, February 5th I went to the second showing of “Transformation: The Life and Legacy of Werner Erhard” at SF IndieFest. 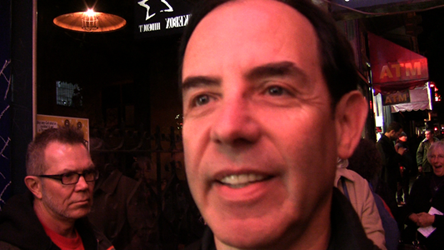 There weren’t many people at the premiere showing last Thursday and I was looking for more people to interact. What a difference a weekend makes; the line went down the block past several stores. In the prior post I gave a short background on Werner Erhard and my involvement in est. Have a look for reference. As in that post, I will report on the audience and film maker during the showing. I started talking with the woman in line behind me. She’ did the est Training in 1971, but after the first Training. Her ex-husband called her after doing the Training, telling her she has to do this thing called est and that he would pay for it. He never reimbursed her, but she’s glad she did it. Later she lived in a communal household of est graduates in San Jose. She credits est for her current marriage. In an est seminar she became serious about finding a worthy mate, making goal lists toward that. While we were going in, I pointed out Robyn watching the line, as the director of the film. Robyn noticed me pointing and they started a conversation. Inside I sat five rows from the front. The theater was about one-third full. Fay Dearborn, the IndieFest programmer, came up to me and said she saw me video at the Thursday film introduction and that I wasn’t to video. I responded that I had only videoed the introduction and decided not to do it anymore without permission. And that Robyn had told me not to so I wouldn’t. I asked if I could take photos, and she said that would be fine. Next to me was a woman who assisted (volunteered) at the Washington House — Werner’s personal business office that was on Washington at Franklin St., San Francisco — where I had also assisted. She was a receptionist. She did est in Aspen when the center opened there in 1973 — one of the first centers. The Training went over six days during the day. At that time most Trainings including hers were done by Werner. I also talked with the guy sitting behind me. He hadn’t done est, but knew people who had and was interested in what the film would show. Toward the end of the film the woman sitting next to made an “Ah-ha” statement. Then when the Q&A began she said that Werner was playing the victim in his story of what the media had done to him and wasn’t taking responsibility for leaving the country. The next person who got asked her if she’d gotten anything out of the est Training. She responded that different people get more and less. She said a guy she knows says he got a lot while another said he didn’t get anything. But he always gets a parking space. People laughed since that was one of the results it was stated you could get from the est Training. She ended in saying that many who took the Training got more about responsibility than Werner. Robyn’s partner who was videoing the Q&A came up the chairs in front of me. He turned around and I thought he’d excuse himself for getting in my view. Instead he said I wasn’t to take photos. I said she told me I could. I meant Faye Dearborn the IndieFest programmer, I think he thought I meant Robyn Symon. He said that no she didn’t say that. Later in the lobby I clarified to him that Faye had told me I could photo and he said it’s not a big deal, just a misunderstanding. Outside I saw the guy who had sat behind me who hadn’t taken est or Landmark. I asked him what he thought of the film. He thought it was very interesting and learned quite a bit. That it was an ongoing story. At the same time the film makers were leaving the theater heading up 16th Street. 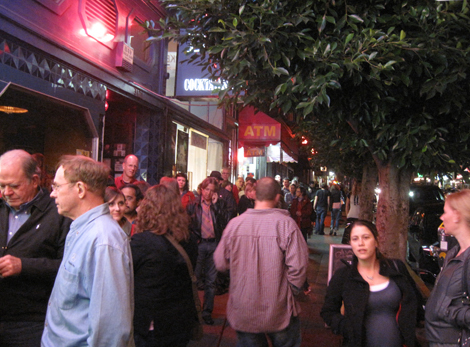 On Thursday February 3rd, 2011 9:15 pm “Transformation: The Life and Legacy of Werner Erhard” opened at the Roxie Theatre for SF IndieFest. San Francisco is where Werner Erhard founded est (Erhard Seminars Training), yet it took five years since the film completed in 2006 for it’s San Francisco premiere. The film makers response to why it took this long is down in the Q&A section. Since I did the est Training (in 1975) and the audience mainly have done est, Landmark Education or know people associated, I will focus on the audience and film maker activities at the showing. First for those unfamiliar, some abbreviated background much of which the film is concerned with. Werner Erhard’s was born September 5th, 1935 in Philadelphia, Pennsylvania as John Paul Rosenberg often called Jack Rosenberg. His High School girl friend, Patricia Fry, got pregnant. At family insistance, they married in 1953 and had four children. In 1960 Jack Rosenberg abandoned his family, leaving with June Bryde. Jack changed his name to Werner Hans Erhard and June to Ellen Virginia Erhard. 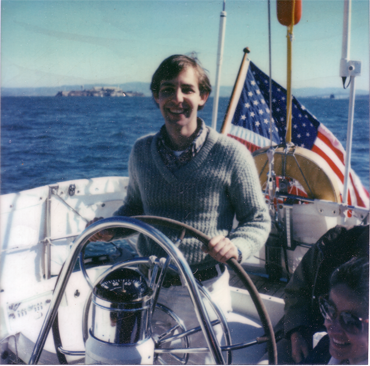 Later in Sausalito, California Werner worked for Encyclopædia Britannica’s “Great Books” program, at the same time he studied Zen, took Dale Carnegie Course, Subud and other human potential courses. In 1968 Werner became interested in Scientology, taking courses up to possibly Grade IV and performed auditing. Finally he became an instructor in Mind Dynamics which he purchased the rights to, modified and named est (Erhard Seminars Training.) est became very successful in the 1970’s and 1980’s going through several name changes from “est”, “est, an Educational Corporation” to “Werner Erhard and Associates” ending in 1991 with “Landmark Education.” Also, in 1991, 60 Minutes aired a segment on Werner Erhard where family members and employees accused Werner of a number of misdeeds. Werner left shortly before that airing and has been in various locations outside the U.S., mainly outside the public eye. 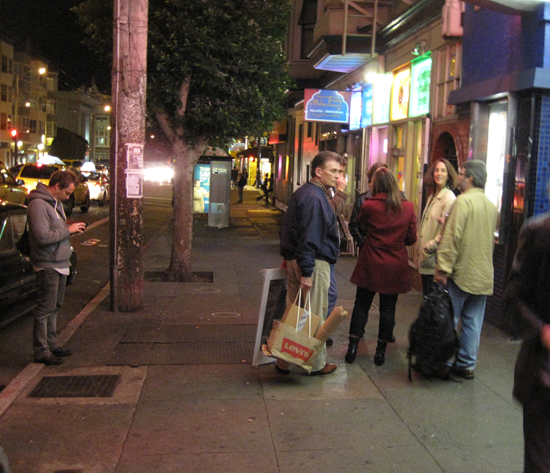 When I got at the Roxie Theatre around 8:45 pm the director, Robyn Symon, was in a circle of about five people. I introduced myself. A line hadn’t formed yet, but about ten minutes later more people showed up. 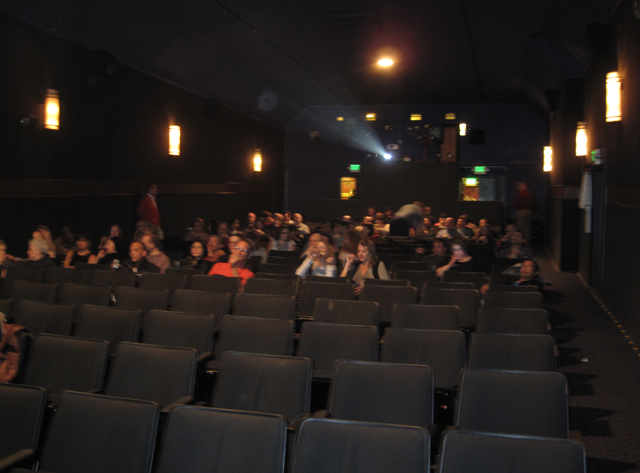 By the time we entered there were a bit more than twenty people in the theatre. I did have the pleasure of sitting next to, talking with and catching up with a woman I assisted with almost 30 years ago. Further back I saw a couple I know from the tech and social media activities in the area. I asked them if they’d done est or Landmark. They said they didn’t. He said he was interested because he’s involved in social activities. She said that she’d heard that Werner had shown he’d changed in the film. I told her that the Executive Producer of the film, Walter Maksym, is Werner’s lawyer. During the Q&A, Robyn mentioned that the film premiered in New York and had gotten mainly positive reviews in the locations it’s been shown. She was then asked why it hadn’t premiered in San Francisco were est began. She replied that is why it didn’t — because of the local press est had gotten and that such journalists would show up. A man in front said that the film was one sided and if it’s a documentary why didn’t it get the points of view from the other side. Robyn mentioned that Rick Ross presented his critical views of Werner. He responded there’s other journalists that could have been included. I asked what’s next for the film besides DVD and festivals. Robyn said they’re in negotiations for TV and international distribution. Someone asked to that if there’s an audience outside the U.S. Robyn replied that there are Landmark offices around the world. The wife of the couple I know and chatted with asked if there was financial connections to Landmark. Robyn said that they had to look for backing when they went to other countries, but didn’t mention the connection to Werner through his lawyer as the films Executive Producer. In the lobby I asked Robyn if we could do a video interview on the film for this videoblog site. She said she’s shy and would rather not. Then I asked if I could video the Q&A. She asked if I already had. I responded I hadn’t but will be coming to the Saturday showing. She said no. I said that there will be more people on Saturday. She agreed. This is the 3rd and final part of the Q&A with Associate Principal Second Violin Dan Carlson, Associate Conductor James Gaffigan and virtuoso piano soloist Gabriela Martinez at the San Francisco Symphony. This is the 2nd part of the Q&A with Associate Principal Second Violin Dan Carlson, Associate Conductor James Gaffigan and virtuoso piano soloist Gabriela Martinez at the San Francisco Symphony. 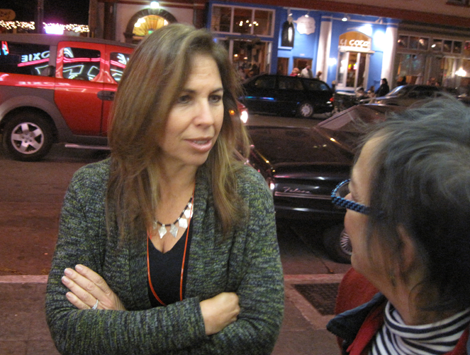 After the inspiring S.F. 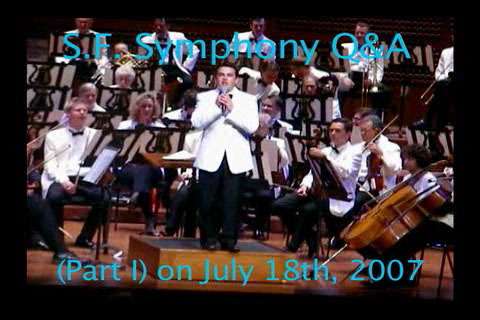 Symphony performance we bloggers went to on July 18th, 2007 there was Q&A. Dan Carlson, Associate Principal Second Violin, James Gaffigan, Associate Conductor and virtuoso piano soloist Gabriela Martinez answered audience questions. Here are the questions at start. 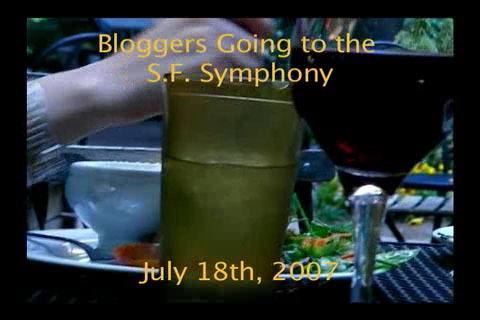 Thanks to Kevin Smokler, the San Francisco Symphony invited Bloggers to cover their July 18th performance, "Classical Romance". It was a rousing performance by conductor James Gaffigan with piano soloist Gabriela Martinez. This is us getting together and heading to the performance. Recording of the live performance is not allowed, but in the next parts I’ll cover the Q&A that was at the end.